British-born actress Archie Panjabi, best known to millions of TV viewers as the sultry, enigmatic investigator Kalinda Sharma on the hit CBS series, “The Good Wife,” has teamed up with the humanitarian organization Rotary International to protect children everywhere by eradicating the paralyzing disease polio. And her involvement extends beyond simply lending her name and celebrity to a cause – she has witnessed the devastation caused by polio. 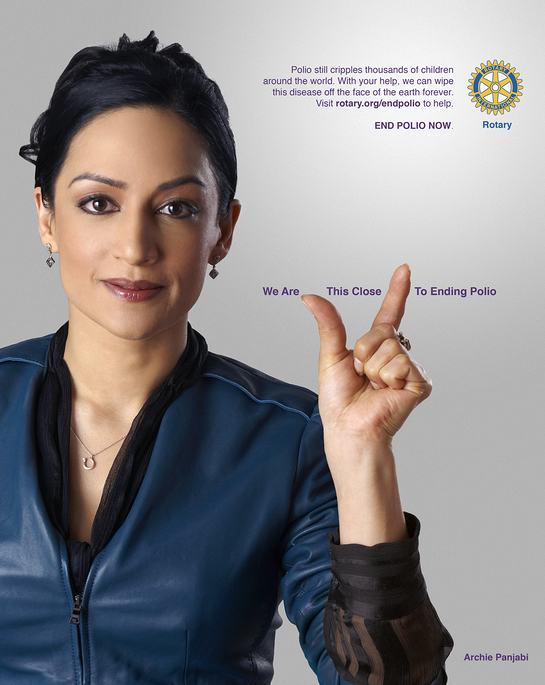 Actress Archie Panjabi lets the world know we are 'This Close' to eradicating polio. There is no cure for polio, but the disease is vaccine-preventable. In March, the Emmy Award-winner took to the streets of New Delhi, India, with a team of Rotary volunteers to immunize children with the oral polio vaccine and visit with young polio patients at a local hospital. In April, Panjabi served as emcee for The Global Vaccine Summit in Abu Dhabi, United Arab Emirates, where she spent time as a child. The Summit was co-hosted by United Nations Secretary-General Ban Ki-moon; Bill Gates, co-chair of the Bill and Melinda Gates Foundation; and Abu Dhabi’s Crown Prince, His Highness General Sheikh Mohammed bin Zayed bin Sultan Al Nahyan. During the event, global leaders and philanthropists signaled their confidence in the polio endgame strategy by pledging close to three-quarters of the US$5.5 billion plan to eradicate polio within six years. Panjabi’s involvement in the fight against polio began in 2011, when she signed on as a celebrity ambassador in Rotary’s award-winning “This Close” public awareness campaign, “We Are This Close to Ending Polio.” Other participants include Gates, Archbishop Emeritus Desmond Tutu, Amanda Peet, Jackie Chan, Jane Goodall, Queen Noor of Jordan, and golf legend Jack Nicklaus. More than 19,000 people from 144 countries have joined the digital application of the PSA, called the World’s Biggest Commercial. In September 2012, Panjabi emceed the polio segment of the Global Citizen Festival concert in New York City’s Central Park. Rotary is the volunteer arm of the Global Polio Eradication Initiative, which includes the World Health Organization, UNICEF, the U.S. Centers for Disease Control and Prevention and the Gates Foundation. Since 1988, polio cases have dropped from more than 350,000 a year to just 223 cases in 2012. Cases this year number at only 33 – providing the best opportunity to make history by ending polio. Only one other human disease, smallpox, has been eradicated. Archie Panjabi helped immunize children in New Delhi. Polio remains endemic in only three countries: Afghanistan, Nigeria, and Pakistan. India, once expected to be the last polio-free country, hasn’t seen a case since 2011. This makes Panjabi particularly proud. “Seeing India become polio-free is tremendous, and I am committed to making sure that no other child anywhere suffers from polio again,” said Panjabi. Rotary is a humanitarian organization with 1.2 million members in 34,000 Rotary clubs worldwide. For additional information, visit endpolionow.org.